Kermit the Frog may have been right when he said, “It’s not easy being green.” Let’s see if we can make it a little bit easier. Wash and prepare all the ingredients. Place the ingredients in a blender and blend until well blended. If you have a powerful blender less juice is needed. If you have a smaller horse-powered blender more juice may be required to blend your drink smoothly. Blend until well combined and smooth. Place the ingredients in a blender and combine until smooth and creamy. If you have a powerful blender less juice is needed. If you have a smaller horse-powered blender more juice may be required to blend your drink smoothly. Green drinks and smoothies are all the rage. Many celebrities such as Oprah, Dr. Oz, Megan Fox and Alicia Silverstone are toting the qualities of green drinks. 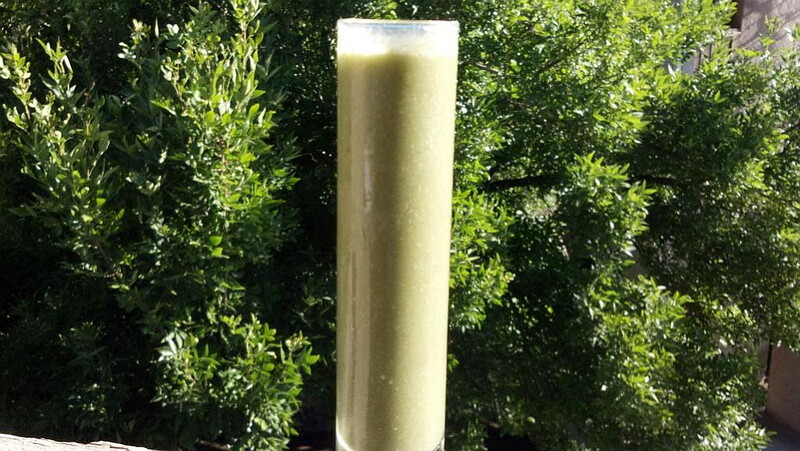 The green smoothie name may be new but the green smoothie concept is several decades old. Nutritionists, doctors and health experts are always telling us we need to eat more greens. Research has shown is that only about 5 percent of those people who are eating healthy food get enough dark green leafy vegetables in their diets. The first thing we need to know is the difference between a green drink and a green smoothie. Generally speaking, a green drink contains vegetables and fruit that have been juiced in a juicer, which strains out that the fiber. Green smoothies contain vegetables and fruit that have been blended whole in a blender, which retains the fiber. Greens should account for one to five percent of a person’s caloric intake per day. Which means if a person is eating 3000 calories a day 150 of those calories should be from dark leafy greens, which breaks down to about three heads of lettuce per day. That would be a lot of salad to eat. It is much easier to drink rather than eat a large quantity of vegetables and fruit. Because you are consuming more greens, you get a lot more nutrient and antioxidant properties that are contained in raw fruits and vegetables. Green vegetables are high in nutrients, minerals and enzymes that our bodies need to function properly. Greens also balance your pH level. Green drinks that include dark green vegetables are high in the omega-3 essential fatty acid which is good for brain function. Greens also support the immune system because they are full of antioxidants. Not only is eating a diet rich in fruits and vegetables good for you, but there are many studies that show vegetables are good for preventing heart disease, obesity, type II diabetes and many types of cancer. The best way to drink your greens is to blend them yourself using fresh ingredients. They are simple to make and loaded with nutrition. Smoothies last in the refrigerator for a couple of days, although fresh is always better. If you’re out shopping and near a smoothie bar, you’ll find that you can purchase one from them. In Utah both Jamba Juice and Roxberry have green smoothies on the menu. If you’re at a health food store you’re likely to find pasteurized green drinks on the shelf for purchase. If none of these options work for you, there are several types of green powder available that can be mixed into water. The most important thing to remember is when you are purchasing a premade green drink or powder make sure that you keep trying different kinds because some of them will taste better to you than others. I believe it’s really important you find a green drink or smoothly that you really enjoy. If you don’t enjoy what you’re eating you’re not going to continue eating healthy foods. Although drinking your greens is really good don’t forget to also enjoy your salad. Click here to see more food articles by Tesia Nadhirrah.